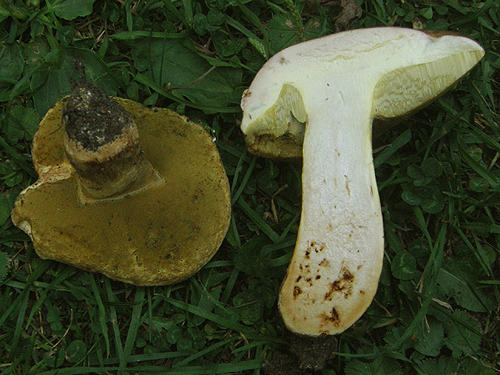 Recent molecular studies have shown that Boletus in its current circumscription is likely an artificial grouping and it is possible that it will be split at some point into smaller genera. 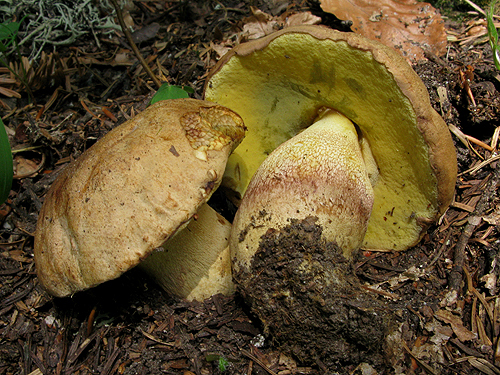 Note that Boletus impolitus and Boletus depilatus for practical reasons are retained here, although there is strong evidence that they are closely related to Xerocomus subtomentosus and its allies. Fruitbody large to medium sized, boletoid, without veil and ring. Stipe solid, with surface usually covered with granules or network. Flesh variously coloured, changing or not when exposed to air. Tubes easily separable from each other, not tearing apart. Pores usually small and rounded. Cap up to 10 cm, convex to flat-convex, usually dry, smooth, fibrillose or finely cracked, beige, ochraceous, pale brown or sometimes pale orange-brown, not blueing when bruised. Stipe club-shaped or sometimes cylindrical, sometimes rooting, yellowish white or pale yellow, rarely discoloring in places or entirely to whitish or brownish, sometimes in the middle or in the upper 1/3 with reddish white, pale red or brownish orange zone, at least in the upper half or most often entirely covered with fine, white, yellowish, rusty orange, orange or orange-red network, stipe surface unchanging when bruised. Flesh white or whitish, under the stipe cuticle and above the tubes yellowish, in the stipe base pinkish or brownish pink, not blueing when exposed to air. Tubes initially lemon yellow, then yellow, finally yellow with olivaceous tint, unchanging when exposed to air. Pores concolorous with the tubes, but sometimes with somewhat rusty tint, darkening but not blueing when bruised. Smell not distinctive. Taste not distinctive. 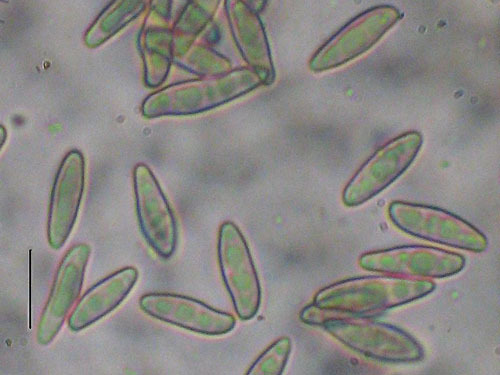 Spores 9.5–15 × 3–4.5 μm, ratio 2.4–4.3. Pileipellis (the cap cuticle) trichodermium of interwoven septate hyphae. Cells of the hyphae cylindrical, finely incrusted. Chemical reactions: the hyphae of the flesh in the stipe base inamyloid with Melzer’s solution. Habitat. Coniferous and mixed forests, mostly mountain species, mycorrhizal with spruce (Picea) or fir (Abies). Distribution. Not yet fully understood. In Europe known from Austria, Bulgaria, Czech Republic, France, Germany, Greece, Hungary, Italy, Montenegro, Norway, Poland, Serbia, Slovakia, Slovenia, Spain, Switzerland and UK. Similarity. 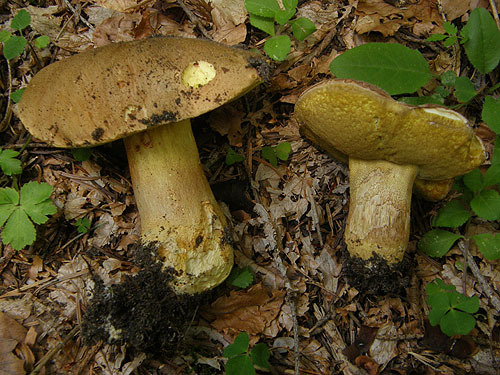 Similar and probably often confused with Boletus appendiculatus, which has darker cap, yellowish flesh that blues in the cap, blueing pores, slightly different spore ratio, and grows under deciduous trees. Breitenbach J. & Kränzlin F. 1991. Pilze der Schweiz. Bd. 3(1). Röhrlinge und Blätterpilze. Verlag Mykologia, Luzern. Engel, H., Krieglsteiner, G., Dermek, A. & Watling, R. 1983. Dickröhrlinge. Die Gattung Boletus in Europa. Verlag Heinz Engel, Weidhausen b. Coburg. Estadès, A. 1985. Une ‘Boletaceae‘ rare et nouvelle pour la France: B. subappendiculatus Derm. – Documents Mycologiques 15: 27–30. Knudsen, H. & Vesterholt, J. [eds.]. 2008. Funga Nordica. Nordsvamp, Kopenhagen. Marques, G. & Muñoz, J.A. 2006. Révision des espèces européennes du genre Boletus section Appendiculati. Étude sur la base de caracteres morphologique et d’analyse des polymorphismes des fragments de restriction (PCR-RFLP). – Bulletin Trimestriel de la Société Mycologique de France 122: 353–366.